Happy New Year everyone! No lists, no resolutions, I’m sure you’ve read enough of them in the past week. And no excuses either why this space has been silent. So, let’s just dive in and indulge ourselves. On a side note, it turns out I started writing this post on Nov. 21. Phew! 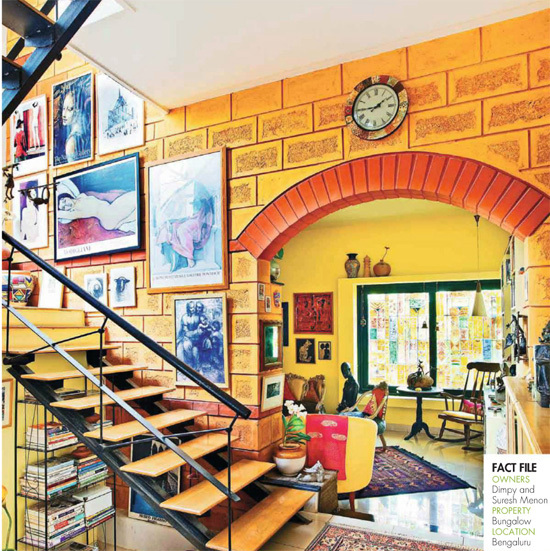 I was flipping through the Diwali (Nov. ’13) edition of GoodHomes, and I just couldn’t get past the Menons’ home in Bangalore. The home tours is by far my favorite section of the magazine. Earlier, I was quite fond of their recipe section too but ever since GoodFood launched, this section has become virtually non-existent. If you happen to a grab a physical copy of the issue and leaf through the pages, you’ll relate to what I’m saying about the Menon home. 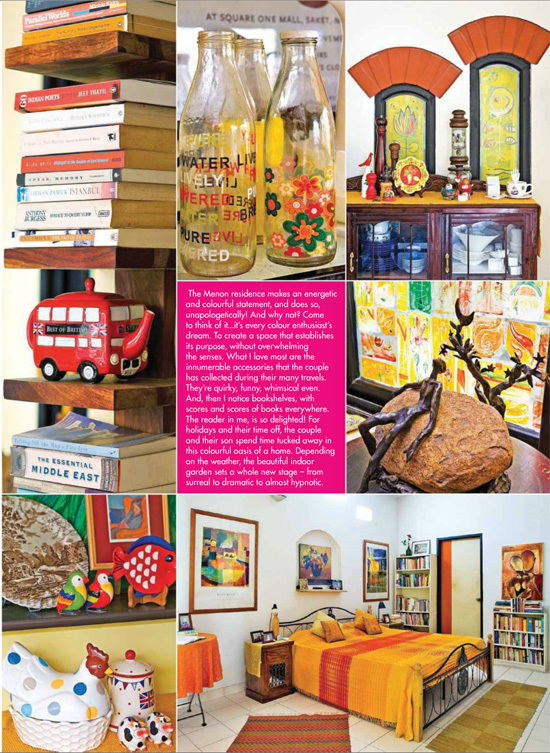 But, what is more striking about the feature is the way Meenakshi Shankar describes the place. I’m sorry..I have to take that back; she has not described it; you can actually feel her experience as she walked through the home. The language is as ornate as the house; as free flowing as the decor.Every word aptly describes the royal treatment every corner deserves. Having said that, it’s time for the tour. 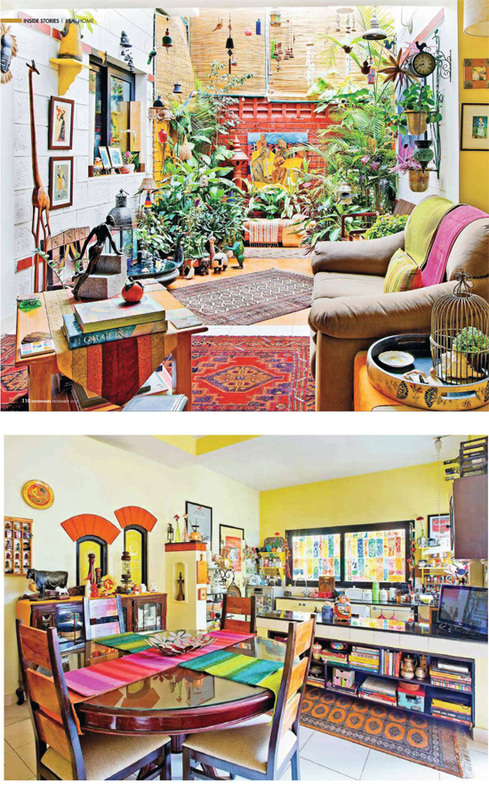 I’ve always wondered how the interiors of an artist’s home would look like? 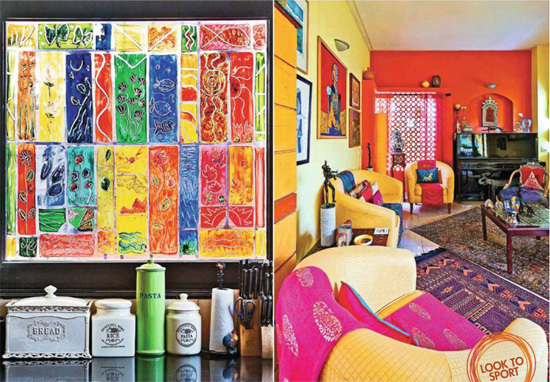 All walls adorned with paintings, no corner spared, color burst perhaps. you bet – this one is all of that and more! But what is it like to live in such a place? The colours must fill the inhabitants with an infinite amount of restless energy, I imagine. What then do the residents do when they want a moment of peace away from the onslaught of colours? We all seek that from time to time, isn't it? I loved the confusion of colors – it must be such a vibrant place to live in! Such a colorful place to live in. As Soujanya says, it must be tough to maintain it.. Loved what you said, Sharon: confusion and vibrancy of colors. Takes an artist's mind to put them together effortlessly, I guess. 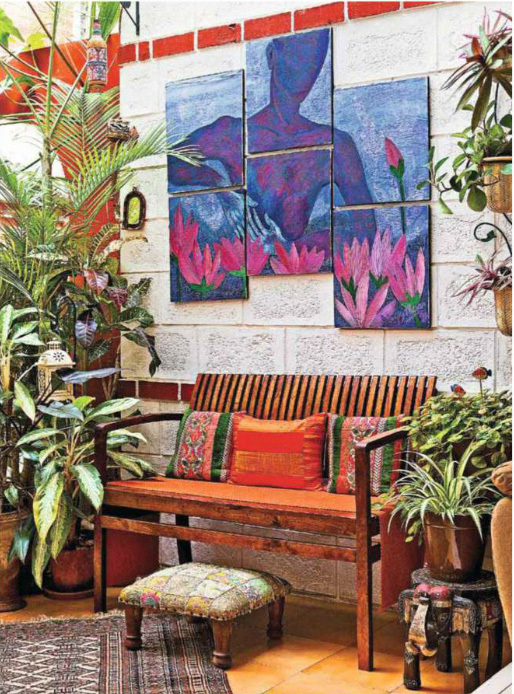 Anitha: I too wondered and from what I see in many homes, color is a very personal choice. I love seeing such homes like the Menons but personally I'm surrounded by shades of white with color in subtle forms that many may not like and find too boring. For this house, I'm guessing, give their profession, they must be feeling very much at home and happy to have created this space. I feel its a beautiful mix of Vibrant Colors. Every bit of the house is artistic. The use of yellow & orange spreads a positivism in the atmosphere.